Received June 18, 2018; Revised July 12, 2018; Accepted July 27, 2018. 만약 혀 절제술로 인해 식괴의 형성 및 이동에 장애가 생기는 경우, 식괴가 기도를 막거나 기도로 흡인되는 연하장애가 발생할 수 있으며, 이런 경우에 구개 증대 보철물은 도움이 될 수 있다. 구강암으로 인해 부분 혀 절제술을 받은 후 음식물을 삼키기 어렵다는 주소로 내원한 환자에게 혀의 기능 운동을 인기한 상악의 연마면 인상채득을 통해 구개 증대 보철 개념을 활용한 상악 총의치를 제작하여, 구개-혀 접촉 압력을 증가시켜서 연하 및 발음에 양호한 결과를 얻을 수 있었다. If complication arises after glossectomy which leads to trouble in forming food bolus or transfer of the food, it is possible that either food bolus may block the airway or dysphagia may occur as the food bolus goes down into the airway. To solve the issue, palatal augmentation prosthesis could be used. In this case, the patient with an oral cancer is having difficulties swallowing food after glossectomy. Through taking impressions of polishing surface of his denture referring his tongue movement, the complete denture for the upper jaw was created using the concept of palatal augmentation prosthesis. This new upper denture increases the palataltongue contact pressure, allowing the patient to perform better swallowing and better pronunciation. 본 증례의 환자는 구강암으로 혀의 좌측 부분 절제술 후 음식을 삼키기 어렵다는 주소로 내원하였다. 혀의 기능 운동을 인기한 상악의 연마면 인상을 채득하여, 구개증대 보철 개념을 활용한 상악 총의치를 제작하였으며, 구개-혀 접촉 압력이 증가되어 연하 및 발음에 양호한 결과를 얻었기에 보고하고자 한다. 만 69세의 남자 환자가 음식을 삼키기 힘들고 치아가 상실된 부분을 보철수복하고 싶다는 주소로 내원하였다. 환자는 15년 전 설암으로 인해 좌측 혀 부분 절제술(left partial glossectomy)과 하악골 부분 절제술(partial mandibulectomy), 상견갑설골근 경부청소술(supraomohyoid neck dissection, SOND) 후 전측 대퇴 피판(anterolateral thigh flap) 및 전완 피판(forearm flap)을 이용해 재건하는 치료를 받은 병력이 있다. 초진 시 환자는 상악 임시의치를 장착 중이셨으며 구내 검사 및 방사선 사진 판독을 시행한 결과, 좌측 하악골 부분 절제 부위의 각화 조직과 좌측 혀 부위의 반흔 조직이 관찰되었고 #33,47는 이차 우식, #34는 잔존 치근 및 우식, #44는 심한 우식 상태였다(Fig. 1). Initial intraoral photographs. (A) Occlusal view of maxillary arch, (B) Frontal view of maxillary & mandibular arch, (C) Occlusal view of mandibular arch, (D) A panoramic radiography. 임플란트를 이용한 보철수복은 치료계획을 위한 상담시 원치 않았으나, 추후 임플란트를 이용한 보철수복을 하더라도 입천장을 덮는 의치가 기능적으로 필요한 것으로 보여 상하악 가철성 의치로 수복하기로 하였다. 연하시 부분 절제된 혀가 구개측에 잘 접촉하지 않아 발음과 연하의 문제가 발생하고 있으므로, 상악은 구개 증대 보철물의 형태를 갖는 총의치를 제작하기로 계획하였고 하악은 #33,34,44,46 발거 후 #43-45 surveyed crown 및 가철성 국소의치를 제작하기로 계획하였다. 또한 좌측의 의치상은 반흔 조직의 전방까지만 조직 피개하도록 계획하였다. 통상적인 방법으로 의치를 제작하는 과정 중, 하악 surveyed crown 수복 후 기능 인상 채득과정에서는 좌측은 반흔 조직의 전방까지만 조직을 피개 할 계획으로 #35부위까지만 기능인상 채득을 시행하였다. (A) Master cast, (B) Wax denture, (C) Wax denture try in. (A) Application of tissue conditioner before polished surface impression, (B) After polished surface impression. 이후 통상적인 방법으로 의치 제작을 완성하여 구강내에 장착하였고, 원활한 사용여부 체크를 위해 구개-혀 압력 측정 및 발음을 평가하였다(Fig. 4, 5). 구개-혀 압력 측정을 위해, 연하 시 혀가 구개에 접촉할 때 JMS 혀 압력 측정기(JMS Co. Ltd, Hiroshima, Japan)로 최대 혀 압력을 측정하였다(Fig. 6, 7). 개선된 정도를 평가하기 위해 무치악 상태와 납의치 시적 시(연마면 인상 전), 의치 장착 직후, 의치 장착 2주 후에 각각 2번씩 측정하여 평균을 계산하였다(Table 1). 연마면 인상 전 납의치 시적 시보다 의치 장착 후의 구개-혀 압력이 평균 3.80 - 4.20 kPa만큼 증가되었음이 관찰되었다. (A) Upper wax denture after trimming tissue conditioner, (B, C) Occlusal & rear view of cured upper complete denture with polished surface impression technique. Upper & lower denture delivery. 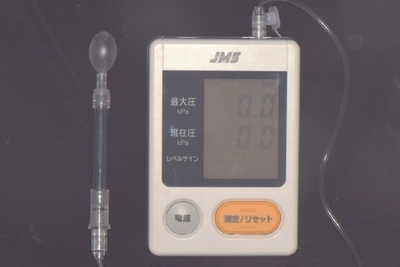 A tongue pressure-measuring device (JMS tongue pressure measurement deviceTM). Ohno 등11,12은 설하신경이 손상되어 연하장애가 있는 환자들에서 조직조정재를 사용하여 연하하는 동안 혀 기능 운동을 인기하여 구개 증대 보철물을 제작하였고, Abdulhadi13는 우측 혀 부분 절제된 환자에서 통상적인 방법으로 완성된 의치에 구개 증대를 위해 조직조정재로 기능 인상 채득하여 추후 아크릴릭 레진으로 교체하였다. 일반적인 환자와 혀 절제술 환자의 상악 연마면 인상을 비교한 결과, 일반적인 환자에서는 전반적으로 구개 전방 및 측방부위 인상재의 두께가 매우 얇았고 구개 중앙에서부터 후방부위로 갈수록 인상재가 더 많이 남아있었다. 연하 시 구개 전방과 측방부위에서 혀가 긴밀하게 접촉하면서 인상재를 구개 중앙 및 후방부위로 이동시킨 것으로 보인다. Ono 등15은 평균 28세의 정상인 10명을 대상으로 연하 시 혀 압력 패턴을 분석하였는데, 혀는 구개 전방부위에 가장 먼저 접촉했을 뿐만 아니라 가장 오랫동안 접촉했었던 반면에, 구개 후방부위에는 마지막에 접촉했고 가장 짧은 시간 동안만 접촉했다. 연하시 구개에 혀가 접촉하는 순서는 구개 전방 - 구개 측방 - 구개 중앙 - 구개 후방 순이었고, 구개 전방부위에서 최대 혀 압력이 가장 높게 나타났으며 구개 후방부위에서 가장 작게 나타났다. 이 측정 결과는 일반적인 환자의 상악 연마면 인상 형태와 유사한 양상을 보인다. 반면에 혀 절제술 환자의 경우 접촉 압력의 저하로 인상재의 두께가 구개 전방 및 측방부위를 포함하여 전반적으로 두껍게 나타났으며, 좌측 혀 부분 절제에 의한 좌측 구개-혀 압력 감소로 인해 좌측 측방부위 인상재가 두꺼워서 좌우가 크게 불균형한 양상으로 나타났다(Fig. 8). Upper wax denture after polished surface impression. (A) Normal patient without dysphagia, (B) Patient with partial glossectomy. Ono 등15의 연구에 따르면 연하 시 정상인의 최대 혀 압력의 평균은 구개 부위별로 19.4 - 25.6 kPa사이에 분포하였는데, 본 증례 환자의 연마면 인상 후의 구개-혀 압력 측정값(21.35 - 21.75 kPa)이 정상인의 수치와 근접한 결과를 보였다. 연마면 인상을 채득한 최종의치를 장착한 초기에는 두껍고, 불규칙한 표면의 구개부로 인한 불편감을 호소하였으나, 약 4주 경과 후에는 특별한 불편감을 나타내지 않았다. 연마면 인상 채득 후, 구개-혀 압력이 증가하였으며, 환자는 연하 및 발음에 대해 보철물 장착 전 또는 연마면 인상 전 보다 개선되었다고 평가하였으며 만족하였다. 혀 절제술로 인해 혀의 형태가 비정상적인 경우에 구개-혀 압력이 감소하여 연하장애가 발생할 수 있다. 혀가 구개에 접촉하도록 하게 하는 구개 증대 보철물은 이러한 연하장애를 개선시키는데 사용될 수 있다. 악성종양으로 인한 기능적인 문제를 갖는 이 같은 환자 외에도 노화에 의한 구강 및 구강주위 근력의 저하로 연하장애를 경험하는 노인환자들이 증가하고 있다. 따라서, 노인 환자 맞춤형 보철치료, 즉 단순히 구강의 해부학적 형태를 수복하는 보철치료보다는 구강기능재활과 회복을 고려한 보철물의 제작으로 치료 패러다임의 변화가 필요할 것이다. Choi SW. Clinical diagnosis of oral cancer. J Korean Dent Assoc 2011;49:136-45. Joo YH, Sun DI, Shin JH, Shin JH, Lee CH, Cho SH, and Kim MS. The results of treatment in clinical NO oral tongue cancer. Korean J Otorhinolaryngol Head Neck Surg 2007;50:929-34. Yoon JY, Lee SH, Lee JY, and Oh NS. Prosthetic rehabilitation for a glossectomy patient - a clinical report. J Korean Acad Prosthodont 2013;51:347-52. Balasubramaniam MK, Chidambaranathan AS, Shanmugam G, and Tah R. Rehabilitation of glossectomy cases with tongue prosthesis:a literature review. J Clin Diagn Res 2016;10:ZE01-ZE04. Marunick M, and Tselios N. The efficacy of palatal augmentation prostheses for speech and swallowing in patients undergoing glossectomy:a review of the literature. J Prosthet Dent 2004;91:67-74. Kwag JM, Park II, and Son MK. Suggestion for understanding and activation of the nursing home dentist system. Oral Biol Res 2017;41:127-33. Sakai K, Nakayama E, Tohara H, Kodama K, Takehisa T, Takehisa Y, and Ueda K. Relationship between tongue strength, lip strength, and nutrition-related sarcopenia in older rehabilitation inpatients:a crosssectional study. Clin Interv Aging 2017;12:1207-14. Sura L, Madhavan A, Carnaby G, and Crary MA. Dysphagia in the elderly:management and nutritional considerations. Clin Interv Aging 2012;7:287-98. The glossary of prosthodontic terms. J Prosthet Dent 2017;117:e1-e105. Toyoshita Y, Koshino H, Hirai T, and Matsumi T. Effect of wearing a palatal plate on swallowing function. J Prosthodontic Res 2009;53:172-5. 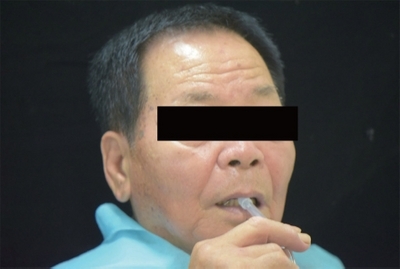 Ohno T, and Fujishima I. Palatal and lingual augmentation prosthesis for patients with dysphagia and functional problems:a clinical report. J Prosthet Dent 2017;117:811-13. Ohno T, Ohno R, and Fujishima I. Effect of palatal augmentation prosthesis on pharyngeal manometric pressure in a patient with functional dysphagia:a case report. J Prosthodont Res 2017;61:460-3. Abdulhadi LM. 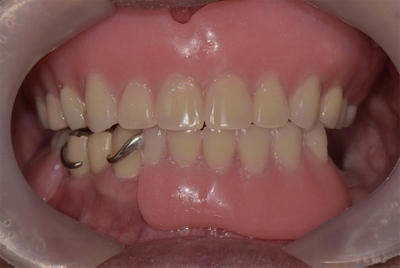 Different techniques for palatal augmentation in partially glossectomized patients. A report of two cases. Open Access Scientific Reports 2012;1:391. Robbins KT, Bowman JB, and Jacob RF. Postglossectomy deglutitory and articulatory rehabilitation with palatal augmentation prostheses. Arch Otolaryngol Head Neck Surg 1987;113:1214-8. Ono T, Hori K, and Nokubi T. Pattern of tongue pressure on hard palate during swallowing. Dysphagia 2004;19:259-64.